Thyme for Cooking Menus: Barbecued Stuffed Pork Tenderloin, easy recipes. Potatoes and tomatoes together? Yes, it works. And with so many tomatoes this time of year, we tend to put them in everything. We'll finish them on Monday. Don't tie the pork too tightly or the stuffing will ooze out. Use any leftover barbecue sauce with the burgers. It doesn't take a lot of stuffing... And it kind of oozes out the top.... But, it does get nicely caramelized on top and keeps the pork moist. 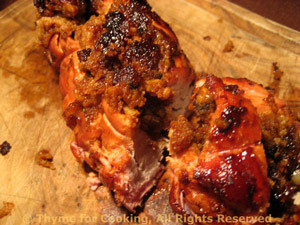 Cook the pork, stuffing side up, without turning, in a covered grill. Heat olive oil in small skillet over medium heat. Add paprika and sauté for 1 minute. Meanwhile, butterfly pork tenderloin - cut it in half lengthwise leaving 1/4 inch intact - so that you can open it like a book. Open it and give it a couple of whacks with a meat mallet so that it lies flattish... or pound lightly with the edge of a plate. You just want it to be flat and easy to work with. When mushrooms are done put into a small bowl and add bread crumbs, herbs, Worcestershire and ketchup. Mix well and spread on one side of pork about 1/8 inch from the edge. Cook pork on barbecue grill for 30 minutes or until done, basting during the last 10 minutes with Barbecue Sauce. When done, slice and serve with more Barbecue Sauce on the side. Could also be baked at 400F for 30 minutes or until done. It is done when 'juices run clear', so - either poke it, slice it and take a peak or use a meat thermometer. See techniques. Mix all ingredients in small sauce pan and bring to a boil over medium heat stirring frequently. Simmer 10 - 15 minutes, remove from heat and use when needed. Sauce will keep for a week in the refrigerator. We are planning for leftovers with this gratin. I normally use Gruyère in potato gratins but I decided to use something stronger with the sage and tomatoes. Use what ever cheese you like - a sharp cheddar could be good, or Muenster. 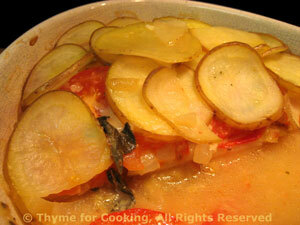 And, Yes, tomatoes do work well with potatoes! Thinly slice the onions and garlic. Heat oil in a medium skillet over medium-high heat. Add onions and garlic and sauté until tender and just starting to brown, about 10 minutes. Slice the tomatoes as thin as the potatoes (you should get 8 - 10 slices per tomato). In a glass or ceramic baking dish just large enough to hold ingredients (I use an 8" X 11" (20 X 27.5cm) oval baking dish) lay 1/3rd of the potatoes. Spread half of the sautéed onions over the potatoes. Add a layer of tomatoes, touching but not overlapping. Spread half of the cheese on the tomatoes and sprinkle with half of the sage. Top with remaining 1/3 of the potatoes. Pour the stock over all, sprinkle with Parmesan, cover with foil and bake at 425F (210C) for 40 minutes. Remove foil, reduce heat to 400F (200C) and continue baking another 20 minutes. Remove from oven, let rest 5 - 10 minutes, cut and serve. My mother put browned butter on all of her vegetables. I don't do it quite that often but once in awhile it's still a treat. 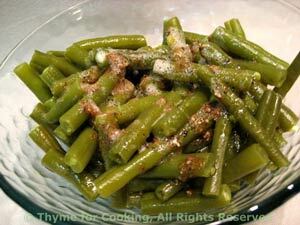 The nutty flavor of the butter pairs well with fresh green beans. Just don't let it get too dark. It will go from light brown to dark very quickly once it starts. Cut into 1 1/2 inch lengths (4cm) or leave whole. Put beans, 1/4 cup of water into a small pan, cover and simmer until done, about 15 minutes. If beans dry out add a little more water. When done drain beans, put into a serving bowl and put the pan back on medium heat. Add butter and brown it, being careful not to let it get too dark. Add pepper and beans, toss to coat and serve.